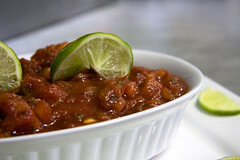 Pin It Image by ayngelina via FlickrHere is a wonderful cranberry salsa recipe by Kris Mayberry. Puree orange (with rind if desired) in a food processor or blender; transfer to a large container. Pulse cranberries in a food processor or blender until coarsely chopped. Stir chopped cranberries and remaining ingredients into the orange puree. Serve chilled or at a nominal temperature. This healthy dish goes great with fish, chicken or as a topping for a salad.